Talk about the stars aligning. 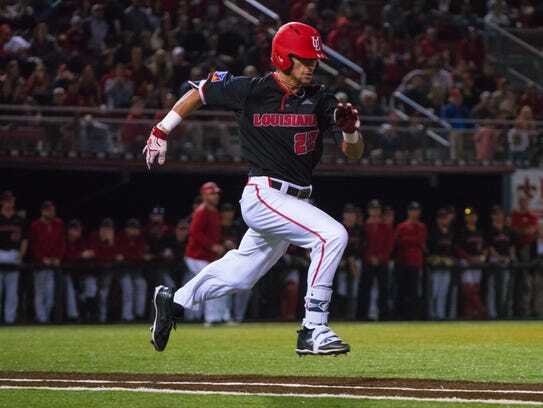 Friday night, there was a Ramos starting in the outfield for UL’s Ragin’ Cajun baseball team at what used to be known as M.L. “Tigue” Moore Field. And sitting in their close friend Mo Hannie’s field-level box down the first-base line, only about 100 feet away from where Marco Ramos was patrolling right field at Russo Park, were two exceptionally proud parents. “I’m going to be a nervous wreck,” Tina Ramos said about an hour before Friday’s first pitch against South Alabama. The father knew what the son had battled through on the way to making his first collegiate start, as only someone whose baseball career didn’t end up like he’d hoped. Not his UL career, mind you. When he completed his career in 1992, earning Baseball America All-America honors, he was in everyone’s argument over who was the best position player in Cajun history. It was afterward, when he was released unexpectedly by the San Francisco Giants organization two years after his stellar college career, that baseball — a game that came so easily with his natural athletic talents — became a source of frustration. But Papo Ramos’ story isn’t built around baseball right now, although a parade of long-time UL baseball fans have turned his appearances at this week’s Cajun home games into one long hug-fest. Everybody who was around the program during the 1991 and 1992 seasons remembered, respected and loved the Puerto Rico native who adopted Acadiana — so much so that he and Tina got married right there at Moore Field’s home plate. Now, Ramos is doing something much more important: trying to rebuild his home island of Puerto Rico after the devastation of Hurricane Maria six months ago. Ramos said that many don’t realize how far Puerto Rico remains from any semblance of recovery. “There have been a lot of natural disasters in the U.S. before, like Katrina was,” he said. “But it’s so much harder when you’re on an island. Everything has to come by boat or by air, and for a long time the airport wasn’t operating. Help doesn’t get there in a timely manner. Ramos should know. In his capacity as acting deputy special agent in charge for Homeland Security Investigations, he’s involved in enforcing more than 400 statutes through Homeland Security’s investigative branch. Ramos has been back in his home country for two years, after serving in Mexico for four years through the U.S. Embassy there. His work with U.S. Customs and Homeland Security has taken him and his family on a world tour that included Vietnam, Thailand and all over Latin America. But Hurricane Maria was different, and the devastation forced Papo and Tina to make a tough decision, and Tina headed back home to Acadiana to her family. Her work with the Spotsylvania County public school system in Virginia, which she did exclusively online from their Puerto Rico home, made consistent electrical service and internet capability essential. “If I hadn’t left there, I’d probably have gotten fired before very long,” Tina said. “She defected on me,” Papo joked. That was also about the time that Marco made the Ragin’ Cajuns’ 35-man baseball roster, after not making that list in 2017 in his first year out of Seminole State College in Oklahoma. He continued to improve his skills, and long-time Cajun coach Tony Robichaux took note of the younger Ramos’ work ethic. That spot makes trips to the ballpark a regular part of Tina’s days now, and Papo joined her during a week’s break from the rigors of helping to rebuild and revitalize his home island. It also brought back memories of the time when he helped to build the Cajun squad of then-coach Mike Boulanger into a national power, and she was a standout on the Cajun volleyball team. Papo led the Cajuns in most offensive categories during his two years, and the Cajuns finished 49-20 in 1991 and 38-23 in 1992. The Cajuns made the NCAA Regionals both seasons as part of a successful run with Boulanger as head coach. It was near the end of that 1992 season that Papo and Tina decided to get married, and Papo wanted their wedding to be special — and very different. It did, only a few minutes after the Cajuns played their final home game that year against South Alabama. Tina was in her white wedding dress, and Papo kept his uniform on, despite it being covered with dirt and grass stains. “Big” was a relative term. Most of the people in the stands for the game stayed for the ceremony, with the Cajun team as honorary groomsmen and teammate Javi DeJesus providing musical accompaniment on his trumpet. Hannie, a friend from the time Papo arrived in Acadiana, served as best man. Papo was drafted by the Giants organization and played rookie league ball in Everett, Washington, and made that league’s All-Star team. One year later he was in Class A ball in Clinton, Iowa, and hitting .300 when he was abruptly released. He worked several different jobs before finally being accepted to a position with U.S. Customs, and he’s served with governmental agencies for most of the 26 years since his Cajun career. Things have changed a great deal from that time, most notably the stunning Russo Park facility that had its full-scale opening this year. 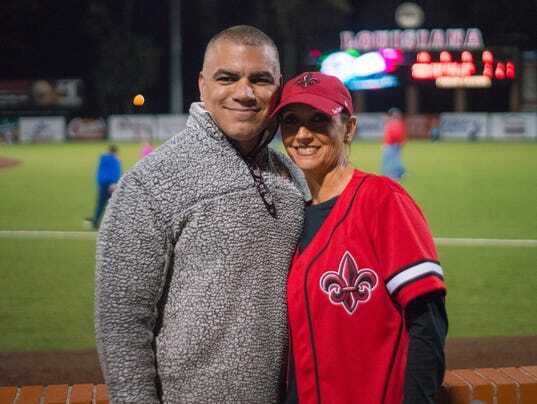 The new park was rocking Wednesday night when the Cajuns rallied to take a 4-3 10-inning win over LSU, and Papo and Tina were in the crowd, just as they were Friday to watch Marco make his first start in what became a 2-1 Cajun victory. “The first time we drove by and saw the stadium, it was like, this is not where I played,” Papo said. “This is amazing. It’s like a dream come true. I was just speechless when I first walked in. I really wish I’d had the chance to play in this place. Photo #5 of the photo gallery is one of Tina (Volleyball 87-92) and Papo (Baseball 91 & 92). Son Marco is a member of the 2018 team. Click here for the 1992 Baseball photo gallery and a special photo of a wedding which took place at home plate.